Gustavo (on the right) at the seminar. 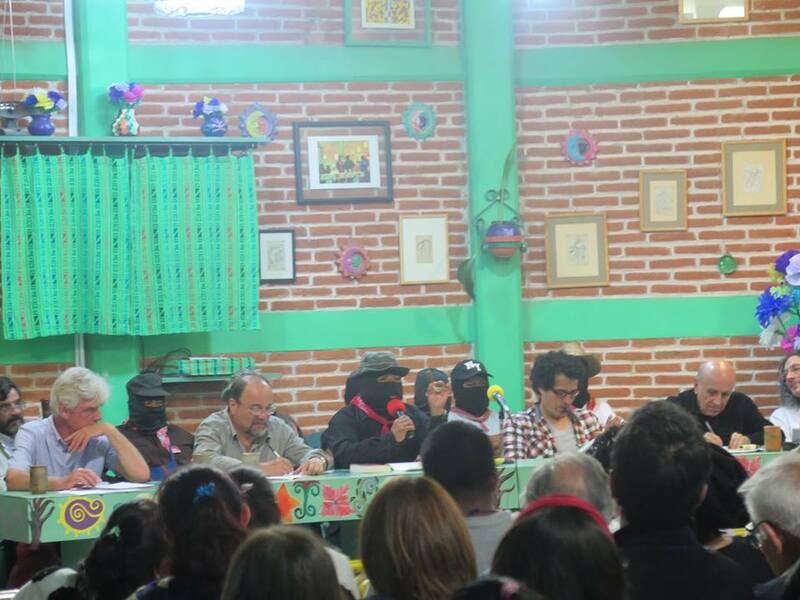 On Saturday, at the closing ceremony marking the end of the seminar Critical Thinking Against the Capitalist Hydra, the news arrived: they were repressing our comrades in San Quintín. In the most unfortunate way, what we had been discussing was confirmed. As Subcomandante Moisés pointed out, this tells us that we may not have the time we thought we had. That the storm is intensifying and attacks us. That we are one with the pain. That although we are not yet healed of Ayotzinapa—we are still waiting for our 43—and now this arrives. And that this demands of us, if we learned anything in the seedbed [the seminar], an immediate reaction in order to find out how to alert each other, how to care for each other, how to weave our stories together. I believe that no one’s pen or word trembled when it came to characterizing the horror. We were charged with emotion, but also with analytical and historical rigour. We were able to show, starkly, not only the many heads of the hydra, but also how cutting them off multiplies them. It also became clear that, despite many brilliant, solid analyses, there is still much more [to be done]: we are just getting started. But at least it was possible to till the theoretical and practical ground for sowing the seeds of knowledge that we learned; thus, to cultivate them in the way of each nursery found in each place where it might be possible to grow these seeds of knowledge. The immediate task was clear. Upon returning home, without irresponsible haste, but with a sense of urgency, we have to multiply the seedbeds. Those who have groups, assemblies, spaces for reflection, autonomous ways of thinking and acting, we must share in them what we learned. It might be in order to venture onto innovative paths that were opened or to travel once again, with renewed eyes, those paths that we have already travelled a thousand times. Those who lack these spaces need to create them, even though it might only be with one or two close friends. One of the most important themes of the seedbed was finding timely agreement regarding the gravity of the current moment. From various stances across a broad spectrum in which important differences became apparent, we recognized the immense dangers that weigh upon us—a we that is already entirely inclusive: no one escapes. Yes, it was fascinating. But the truth is that the encounter has made us anxious. What are we to do in the face of this circumstance that is so overwhelming, so threatening, so immediately catastrophic? It is a condition that leaves no room for optimism and scarcely for hope. Again and again, we asked ourselves the old question, because we knew that the old answers no longer work. But still they weigh us down: when one radically gives in, the imagination is paralyzed. We didn’t get an answer. We heard a lot. That is the nature of today’s resistances and rebellions. They don’t consist solely in opposing something in order to resist aggression from whichever of the hydra’s heads. To many of those who participated in the seedbed, it was clear that the only effective way to act is to multiply the nos—the radical rejection of what pursues and oppresses us; yet in the same operation to multiply the yeses—the various ways of constructing the new world. I believe that many of us also learned a core lesson: not to cling to a stance or belief about what can be better. 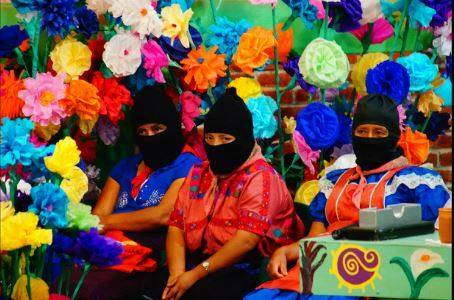 Again and again, in the oft-repeated words of Subcomandante Moisés, the Zapatistas took away the desire and the ability to idealize ourselves and also made us see that we shouldn’t imitate ourselves. It was necessary to practice an almost surgical operation. The excitement of being in Zapatista territory, the mark that the escuelita left on many participants, the feats of the last thirty years, the vitality of an initiative that seems to be the most radical and important in the world, and even the very fact that the Zapatistas called us to this seedbed with its traditional sense of political opportunity—all this taken together leads to losing a sense of reality. Although it was feasible and sensible to replicate this experience as is, in everyone’s place, we no longer have the time that we once had. Of the many challenges that we carry, one of the most difficult is how to share these reflections—and even the sense of urgency—with peers and siblings who seem distracted, who neither perceive nor feel the gravity of the current situation, who still harbour hopes that things will soon return to normal and who, therefore, still cling to their habitual ways. How do we find the simplest words that allow sharing without offending … in ways that open other minds and hearts to this dawning awareness that we need to join together? We are carrying many loads on our shoulders. But they are shoulders renewed and full of courage. We can walk and even jog with this new weight.